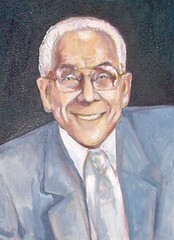 I took this picture in 1988 from Mel's office at Baruch, where he was teaching at the time. 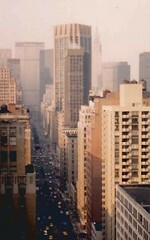 That office had a great view of Park Avenue, the Pan Am and Chrysler Buildings, and the taxi cabs in the street below. My trips to New York City were much more frequent when we lived in New Jersey, but I still get there occasionally, and it is fun to take the train down from Boston. I scanned and cropped this image tonight; I think the pink cast is due to early morning light, but in any case, I like the effect. I am posting this image tonight in celebration of my train trip tomorrow to New York City to visit family, especially my aunt who recently moved (back) to New York from Colorado.  This is an image of the sky at sunrise that I cropped from a photo taken during my most recent trip to Colorado. The Colorado mountains are so amazing that sometimes you forget to look at the sky, but there's a color and light show at dawn every day! Long Hill Gardens is one of the best places to go for walks, with or without dogs, but we prefer with dogs. After we walk around gardens near the house, sometimes we walk all the way back down the road towards the entrance, through the double line of fruit trees. In the spring, we see blossoms on the fruit trees and look for lilacs near the fence. In the fall, we see apples and crabapples. I took this picture a few weeks ago on one of our walks, and tonight I cropped it just a bit to focus attention on the road. 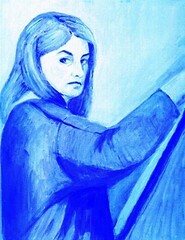 I just finished reading a book about melancholy in English literature, so I thought this would be an appropriate image to post today, even though it is just the painting that is blue, not the artist herself. I painted this a few years ago as an early assignment in a portrait painting class, which was to paint a self-portrait using only one color. 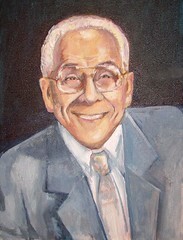 I think this painting is more successful as a painting than as a portrait. (Does it look like me? Maybe some.) Notice the intensely pained expression, which is due not to melancholy but to the stress of being both artist and model simultaneously. 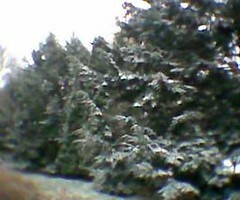 We had an early morning dusting of snow for Thanksgiving, and I took a quick picture with my phonecam before it melted. I wanted to document the snow for Mel who is in Florida (which is no doubt why it snowed). Today I edited the image in Painter IX and used digital chalk to remove some distractions in the background. 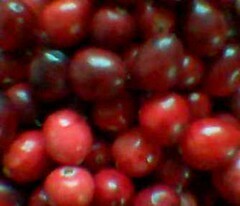 Today I made cranberry orange relish, but while I was getting the ingredients together, I found myself admiring the colors of the cranberries so much that I decided to take a picture with my phonecam. 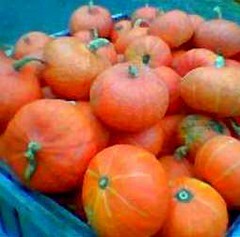 I guess it is about time to make the pies, so here are some pumpkins. I took this photo with my phonecam several weeks ago at Russell's Orchard in Ipswich. Last night I cropped the image to focus on the bright colors of the pumpkins. This image is from a photo that I took on my most recent trip to Colorado. I liked the sky and the mountains in the photo, but there was a pesky street lamp in the way. Tonight, I decided to try a little slight of hand, so I opened the image in Painter IX and covered up the lamp post with some digital chalk. While I was at it, I darkened some distracting clutter in the foreground. Then I cropped the image to focus on the timeless magic of the Colorado mountains. This is the portrait I am working on as it looks tonight. Today I made some changes to the face, trying to catch the same expression as in the photo I am using for a reference. I also made some adjustments to the figure. This kind of scenery is fairly common here in Massachusetts, but that doesn't make it ordinary to me. 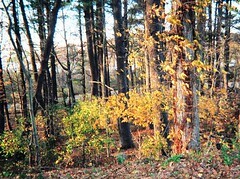 I see this wooded area almost every day. Recently I walked by this scene in the late afternoon and the sunlight made the leaves look golden against the trees, so I decided to take this picture. Tonight I cropped the image to improve the composition. Here in Boston, it is getting dark earlier, and the air is getting colder. It's time for a nice sunny image from Portugal. I took this picture on a hot July day in Lisbon several years ago. This is where Mauro parked his car so we could go explore the Alfama, the oldest part of Lisbon. 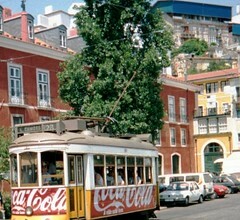 You can see the layers of time in this photo: modern architecture in the background, old tile roofs and stucco walls, and then suddenly, there's that cable car with the Coca Cola sign. 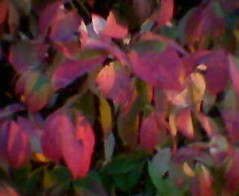 Two days ago, I saw this fire bush, and took a picture with my phonecam. It was late afternoon, and the light was perfect. I was happy with this image just as it came out of the camera. So here's one more image to celebrate the bright leaves of November. The temperature rose overnight, so the day began with fog, which burned off by mid-morning. 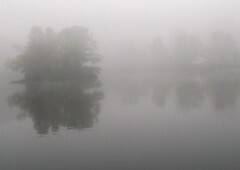 But it reminded me of some photos I took last month when we had some very heavy fog. Here is one of them. Last month, I used my digital camera to take this picture of the little island in the middle of Kelleher Ice Pond, here in Beverly. I have been thinking that it is darkness coming so early in the day and the gray overcast skies that make me run to find the bright red leaves in the fall sunshine, before winter comes. 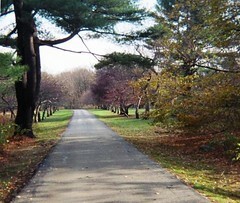 Here's another image from last weekend's walk at Long Hill Gardens in Beverly, Massachusetts. 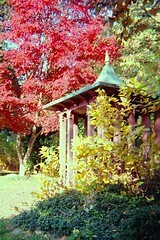 We almost always pass this little gazebo, but last week it looked spectacular against the bright leaves, so I took a picture. Tonight I cropped the image to focus on the gazebo, and adjusted the contrast just a bit. We have been having cool nights and some nice warm days, so we are finally getting those brilliant red leaves I have been waiting to see. We are trying to take advantage of the good weather while it lasts by taking a lot of walks. I can't resist photographing the autumn leaves. I took this picture at Long Hill Gardens over the past week, just finishing up the unused film in a couple of disposable cameras from a recent trip. Yesterday I got the photos back and edited some of them last night. The color in this image is just as it came out of the camera. I did crop the image just a bit to focus on the tree, but that's it. Is this brilliant crimson due to the magic of nature or due to the magic of Kodak film? This morning, Mel and I went to Cambridge for coffee at Peet's and then some time in the bookstores, first the COOP and then the Harvard Bookstore. 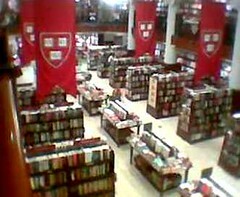 This is a picture of the COOP bookstore that I took from the second floor balcony with my phonecam. Tonight I cropped it and adjusted the contrast to make the image a little clearer. This morning I finally had a chance to get back to the portrait I am painting for my friends. Today I changed a few details and added some light on the face. I also sketched in the figure and painted in dark values for the background. It's been just about a year since my last trip to Porto. 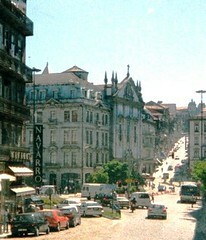 This is a view I have seen on almost every visit, driving into the center of the city. Tonight I cropped this image out of a larger photo, and adjusted the brightness to bring out the detail. 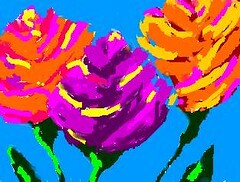 I drew these roses on my handheld computer's paint program last year, and tonight I opened the file in Painter IX and cleaned it up for posting with a little digital chalk. I decided on the title because this is digital art, and because the colors are so hot. I am posting this today for a special friend whose birthday was today. We took art classes together in school, and always liked to paint with hot colors. On one of my visits to Portugal, I took along some xerox color copies of my pastel still lifes so Mauro could see what I had been doing. Today I found out that he is planning to frame some of them to hang in his new kitchen in Porto. 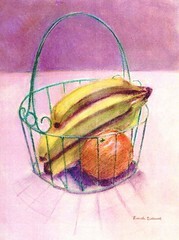 That's why I decided to post this tonight, a pastel still life that I drew a few years ago. I chose this one because it is hanging in my kitchen. I can't resist posting just one more picture of autumn leaves. These leaves look like they are hand-painted, but they aren't, not really. I have been chasing autumn leaves because I love to look at the colors. Today I took this picture in my front yard with my phonecam, looking for deep reds and oranges. But when I loaded the image into my computer, for some reason the leaves looked pastel. I decided that I like the magical effect, so I decided not to correct the colors. 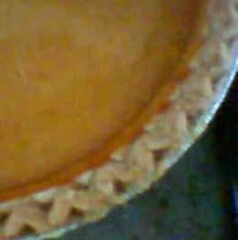 Instead I just brightened the image a bit and cropped it to focus on the leaves. Fall is great just as it is, but imagine what November would look like if all autumn leaves were in pastel colors! 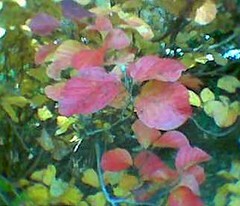 Here's another picture that I took with my phonecam in my recent search for colorful leaves at Long Hill Gardens. 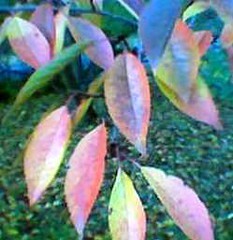 I like these pink and gold leaves; they look almost iridescent. 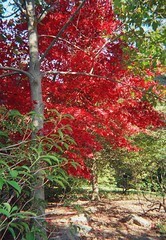 I have been on the lookout for red autumn leaves, which have been slow in coming to Massachusetts this year. 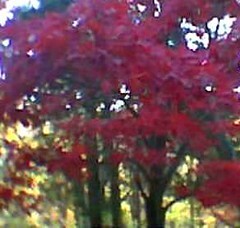 But a few days ago, we went to Long Hill Gardens, where I saw this tree in bright scarlet. I took this picture with my cameraphone and tonight I cropped it to focus on the leaves and added just enough contrast to sharpen the image. 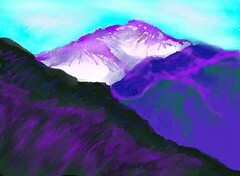 This began as a little sketch on my handheld computer's paint program (Clie.) But due to some problems with my handheld, I had to do a re-set with this file open. So I lost a fair amount of the original sketch. Tonight I loaded the image into the computer, and opened it in Painter IX, where I finished it with digital chalk. Things often turn out better than expected, in art and in life. 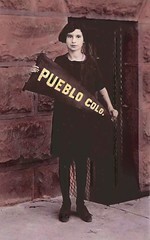 One of my favorite family photos is this image of my mother. It is hanging on my wall in the original black and white. The background is Central Grade School, which I also attended decades later. Tonight I scanned the photo into my computer, cropped it, and added some gentle color with Painter IX's digital watercolor. My mother's birthday was in early November, so I decided to post this tonight. 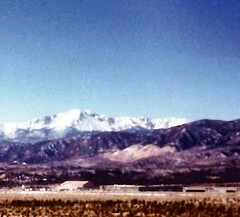 I was looking at my photo albums and found a photo of Pike's Peak taken over ten years ago. 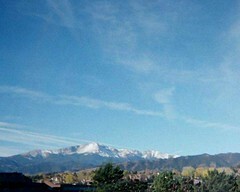 But Pike's Peak is a Colorado classic, one of the few things that remains unchanged when I go back home to visit. Tonight I cropped the image to focus on the mountains and enhanced the color just a bit. 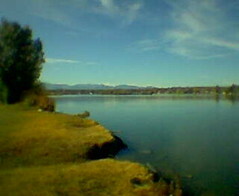 Here's a picture of Sloan's Lake in Denver on a sunny afternoon. You can see the mountains in the distance.